I began to realize how much children need interaction, on their level. They love when I kneel down to talk or play with them. They prefer small dishes and utensils, that are easier to manage. They crave the independence that comes with being able to reach their toys, books, and clothes by themselves. A child-size table and chair set is a great way to encourage their independence and exploration. The award-winning Nordic table and chair set, by Guidecraft, is perfectly designed for children to play, eat or create with ease. The bent wood contours, ensure that there are no sharp corners, for little children to run into or scrape themselves on. The seats are rounded and easy for young children to use. When I opened the box, I was surprised and delighted with the smell of cut wood. Each leg and seat was perfectly sanded, and came with pre-drilled holes. 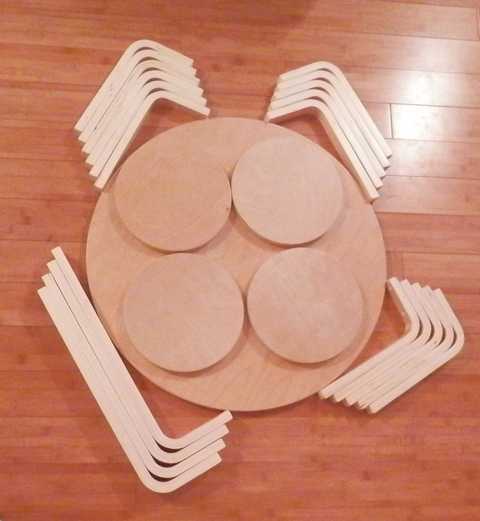 The legs of the table and chairs perfectly aligned with the pre-drilled holes. With the included allen wrench and screws, I had the entire set put together, within twenty minutes. I am very pleased with how sturdy each piece of wood is, and how solid the entire set it. It was definitely designed to withstand plenty of use by children. Once the set was assembled, the kids decided to celebrate with a tea party. The chairs were the perfect size for the kids to use. They were also light enough for them to easily lift and maneuver. 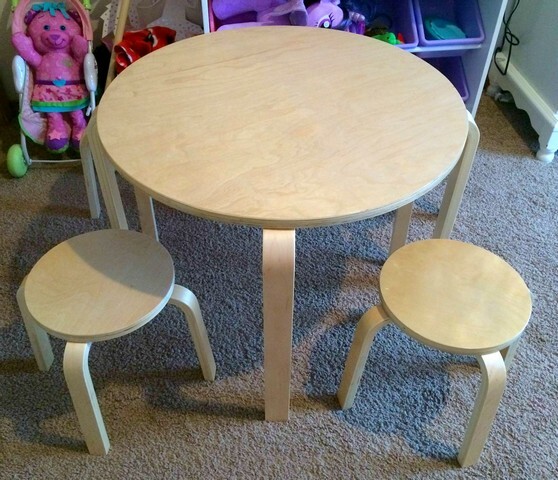 Most table and chair sets, for children, only include two chairs. With two additional chairs, the Nordic table and chair set is perfect for when friends come to play. Hooray! No more fighting over chairs. It will be the perfect table for clay creations and princess tea parties. It will also be a perfect place for school work and reading time. 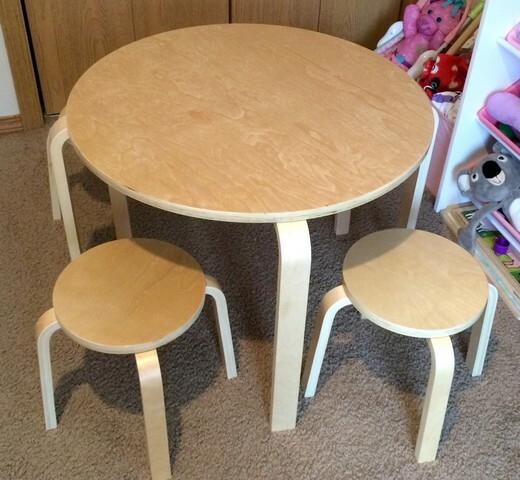 I’m so excited for all the fun activities that my children can do with the Nordic table and chair set. The Nordic table and chair set comes in natural (pictured above) or color. 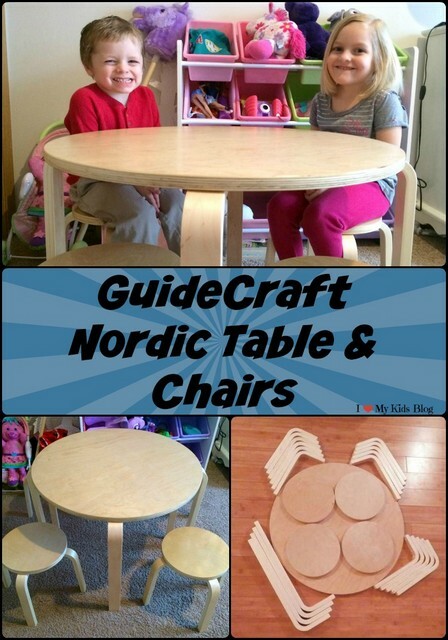 I highly recommend the Guidecraft Nordic table and chair set, as a great product for your home or early education center. It retails for $179.95, and is available on Guidecraft’s website. « 5 steps to a cleaner house and how to get the kids involved!